I put two prestas in the cap, in one I’d removed the core, just cut the spindle with some pliers. 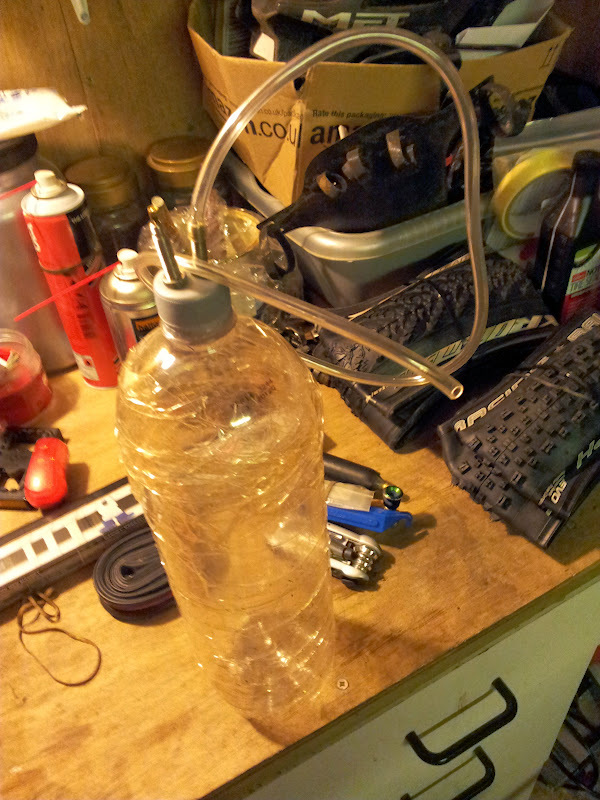 And used the other to add air, just nip the tube to prevent air flow until you’re ready, fingers or bulldog clip. just nip the tube to prevent air flow until you’re ready, fingers or bulldog clip. I tried fitting the valve in the base of the bottle originally – just dropped it in and jiggled it until it poked through. It worked but didn’t seal that well. I’m now using two valves in the cap, which works better and is marginally less worrying. Anyone done this with the head/tubing from a dead track pump, and what brand was it? Make a washer out of an old inner tube ? Make a washer out of an old inner tube? Thought of that. May have to try putting one on the inside as well as the outside, and getting hold of a small Jubilee clip to make sure it’s not the hose. Do have an old Mavic UST valve stem that might work; IIRC there was a rubber o-ring that came with the rim nut for that but it might still be on the rim with the replacement valve. My set up leaked air from the cap which made it hard work to get up to pressure but a bit of glue around the cap/valve sorted that. I use a 10mm spanner (the round end) to hold the kinked hose to hold the pressure in the bottle. When up to pressure just pull spanner away to release the air. Didn’t even need the ghetto tubeless inflator on my current wheelset (ZTR flows) as they pumped up using a track pump but it works perfectly for my other wheelset. Only a complete idiot would try something as stupid as this. There’s a couple of holes in the wall of the compressor house at my local sub aqua club from a couple of know-it-all’s messing about with tanks. My company manufacture high-pressure regs & I’d implore you not to mess about with diving tanks. Pumping pop bottles to 7 bar is not too bad, as the air is gone in a second or two, but 10 bar venting from a hose on a 10 litre tank will whip about & hurt someone. I’ll grab some pics next week, but a chap in the office has rigged up a big air horn on his commuter, linked to a 2 litre pop bottle & a 3/2 valve. Oddly enough, the cap end is completely airtight; it’s the valve at the base that leaks. I shall try packing it with plasticine (well, blu tack) and failing that, Mr Araldite (the glue of champions) will be making an appearance. My rims are no longer true enough for tyres to go up without a bit of ‘assistance’; when they were new it was possible to get a tyre on with a track pump. Made one today, worked a treat! I finally got round to making mine last night having read this thread when it was posted. And a few months ago I shared the idea with an Australian forum, and there’s been many happy punters referring to this and that thread. Alternatively, to save yourself 9p and all that d1ck1ng about, you could just use a track pump and press the tyre down above the valve to create a better seal. Works every time for me, ghetto or otherwise. If you’ve made one, don’t worry, just stick your Cypress Hill ‘tape’ in and take some hits. the thread resurrection troll strikes again. Reading this with interest – but not having attempted tubeless at all yet…can someone humour an idiot and explain why this is needed? I assume its to inflate the tyre to a decent pressure very rapidly? But why does that help seal the tyre to the rim more than just the track pump? Sorry, perhaps not the right thread for such a simplistic question – but planning on giving a go soon, so intrigued. It’s all about volume, getting volume of air into the tyre quickly to set the bead into the groove in the rim. Cheers, that’s what i thought, but i assumed the tyre seating in the rim was what happened normally anyway….but at a guess that’s because you have the tube full of air pushing it into place? No tube, harder to get the force required to push it into place? tried a few ways and found the garden sprayer worked best. Yep, after almost pressing the buy button on a compressor from Screwfix after years of the straight up/no chance lottery and struggling with a pair of Rocket Rons today I tried this as a last resort. I’ve run tubeless for years and have always got them on eventually but fed up with struggling at times. Took about 10 minutes to make. Used two prestas one with the core and one without and a short bit of tube from a previous tubeless kit. Mole grips to kink and hold the the tube. Pumped up to 60 psi with a track pump, let off mole grips and hey presto it worked first time on a tyre I had been struggling with for an hour. Absolutely brilliant and still have power in my arms!! Just need some hose and I’m going to give this a try. Used to make bottle rockets with the kids and we found a fizzy bottle has a sweet spot of about 120psi about one quarter to one third full of water. We used to rig them up to a 12v car compressor and a release system based on a male hose lock bonded onto the bottle using resin bond, and a female hose lock in an angle iron frame with a release mechanism using an old brake lever wired to the slider release on the hose lock. Finned, our record was about 500 metres total flight. Was talking to one of our fitters the other week and I was on about the coke bottle compressor and he wasn’t to keen on the idea of me messing about blowing up coke bottles and told me to leave it with him. Thought no more of it and this is what he handed me today. He said he’s still looking for a pressure gauge for it. 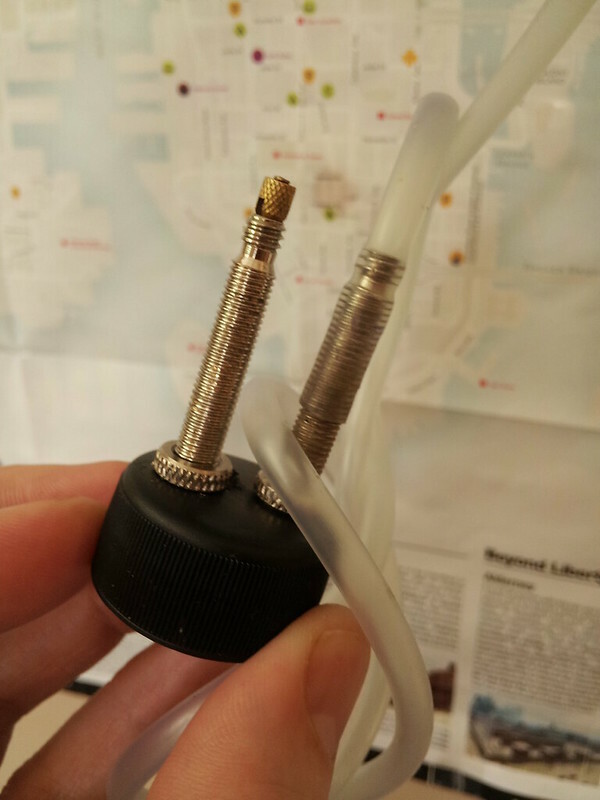 i want to use this method to inflate 4″ fat tyres, set up using the 24″ split tube ghetto procedure, and my 24″ tubes do not have fancy valve stems! You buy some tubes that have removable valve cores. It’s not about the adaptor – it’s about how much flow you can force through a normal presto valve. You can deliver the air much quicker with the core removed. By all means try it without removing the core but it’s just less likely to work. So I did this last night and it didnt work, bottle was leaking air – presumably because the valves weren’t tight enough in the cap/lid of the drinks bottle? Any tips or just man up/tighten with tools? you got it, tighten the hell out of it. It could still work with leaking air if it’s not too bad and you’re quick. Maybe put a small square of gorilla tape where the valve goes through the plastic to help seal better or something squidgy. I had to make the valves enormously tight, way more than I’d use on a wheel. And then threw a wee bit of stans sealant in to see what happened. Not sure if that’s what fixed it but it ended up almost perfectly airtight, held 100psi for a week with not much loss. dollop of silicon on the inside of the cap?